Elon Musk is known around the world for his innovative creations such as Tesla Inc., Neuralink, OpenAI, SpaceX, and The Boring Company among others. And his latest invention is just as cutting edge as the rest. The SpaceX Hyperloop is Musk's answer to slow, expensive, problematic forms of ground transportation between busy cities. The Hyperloop will be a newer, faster, safer, less expensive and more convenient form of transportation between high traffic cities less than 900 miles apart. Over the years, Musk's inventions and professional endeavors have jump-started innovation throughout adjoining industries, and W.C. Branham President Troy Branham expects the same thing to happen with the Hyperloop. "Look at all the advances in batteries since he got into electric cars, not to mention all of the other innovation he inspired," says Branham. "We're incredibly excited to see how his involvement with the Hyperloop impacts fluid power and power transmission." The Hyperloop is a proposed high-speed form of transportation between two cities, (say, San Francisco and Los Angeles, California). Pods carrying 28 passengers each would travel through a tube at up to 760 miles per hour, taking only 35 minutes to get from one city to the other. The same trip would take 1.25 hours by air, 5.5 hours by car, and 2.5 hours using the California High-Speed Rail, the other contender for a new high-speed transportation system between both cities. 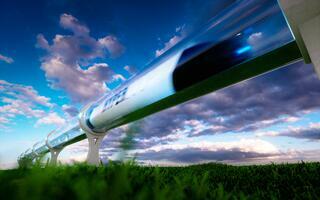 The Hyperloop tube system would be constructed above ground on pylons following California's Highway 5. When the rail must deviate from the highway, it would only disrupt land the size of a tree or telephone pole. An on-ground rail system, by comparison, would require 100 foot-wide dedication. The Hyperloop is also less susceptible to Earthquakes than a ground-based rail system. This innovative transportation system is estimated to cost under $6 billion. Although conceptually the Hyperloop works, a functional prototype is yet to be constructed. To accelerate the development of his prototype, Musk's SpaceX created a Hyperloop competition in 2015. Undergraduate, graduate, and the most exceptional high school students from around the world were welcome to participate to design and build the Hyperloop Pod. In January 2016, the student teams shared their pod designs at Design Weekend. The top teams advanced to the build phase. Teams spent the next year working to construct their vision of the pod. Last January, teams tested their pods on the Hyperloop test track near SpaceX's California headquarters. After completing two rounds of competition in 2017, Competition 3 is even more challenging. This round focuses on maximum speed and successful braking without damaging the Hypertube test track and the vehicle itself. The other criteria is that all hyperloop pods, unlike the previous competition where SpaceX used a pusher to get the pods moving, must be self-propelled. The WARR Hyperloop entry by the Technical University of Munich took 1st place honors with a speed of 201 mph (323 kph) during Competition 2. Team Paradigm from Northeastern University, Memorial University of Newfoundland took the silver and Team Swissloop from ETH Zurich took the bronze. Though, the Delft Hyperloop (Delft University of Technology) had the highest overall score of the approximately 24 team entries. Competition 3 will be the run for the roses as more than 20 team entries will push their Hyperpod’s to the limit later this summer. We expect to see Hyperpods traveling more than 300 mph. Competition 3 will also include a Levitation Sub-Competition which will include maglev form of transport. A listing of those teams already selected by SpaceX can be found on the SpaceX Website.